We’ll start by shuttling to the Yanamayo Pass at 4,350 m (14,721 ft.) – literally Sky High!! – from Cusco or Ollantaytambo in The Sacred Valley. 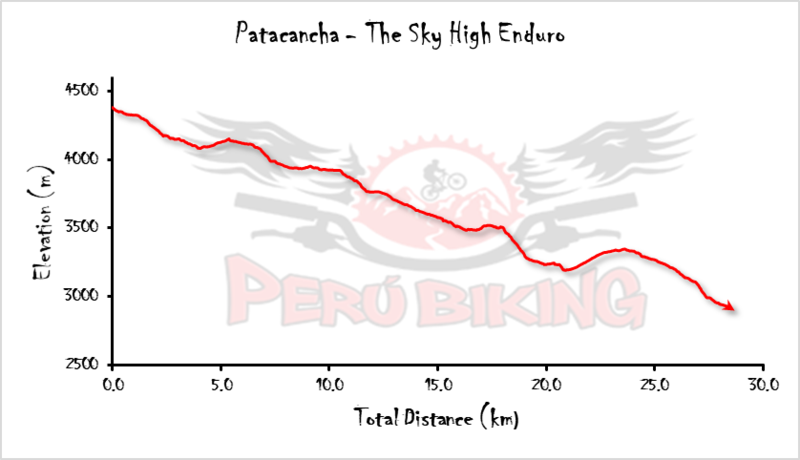 There we’ll begin the internationally renowned “Enduro Patacancha” race course, which, according to MTB magazines, is one of the most demanding singletrack trails in all of Peru for Enduro mountain biking. This course has it all! Climbs. Rock gardens. Flow trail. Alpacas. You name it! We’ll split the course with a visit to the local community of Willoc, where we’ll enjoy a typical lunch. Afterword, with legs fully charged, we’ll pedal towards the Pumamarka Inca Ruins to then finish the day in epic fashion: a singletrack lined with native vegetation, a healthy serving of rock gardens, all situated above Incan stone terraces. The Patacancha Enduro trail ends in the town of Ollantaytambo at 2,790 m (9,154 ft.). Our shuttle returns to Cusco at the end of the day. But if you have plans to visit Machu Picchu, the Ruins of Ollantaytambo, or to travel on to Quillabamba in the Peruvian jungle, you might choose to remain in Ollantaytambo. Hey, we’re flexible. We’re happy to help arrange lodging in either Cusco or Ollantaytambo or to assist in planning your visit to Machu Picchu. Just ask!